I had a bit of a surreal moment this afternoon when I glanced in the mirror before heading out for school pick-up. I caught a glimpse of something on the side of my face, and I leaned in to check. What I saw shocked me. I saw my face close-up, not over the bathroom sink a few feet back, and I actually looked for longer than two seconds. Who was this person staring back at me? Sure – every day I look briefly in the mirror when I brush my teeth and blow dry my hair but I am usually thinking more about the grocery list or the next email I need to write. After all, I know what I look like, don’t I? But apparently I was not as familiar with my own self as I had imagined. Because today I saw someone totally different than who I usually see. Today I really saw myself. Today I saw that I’m a true grown-up now. When did that happen? I have a few dozen grey hairs and I don’t have a baby face with chubby cheeks any more (I can’t believe I still think of myself as a kid). I saw a woman who has born three children and is now responsible for feeding, clothing, and raising them to be responsible and caring members of society. A woman who has known joy, loss, self-doubt, and gratitude along this road called motherhood, and still questions if she is a good mother every single day. I saw someone who couldn’t wait to watch the next episode of Downton Abbey (and felt a bit guilty about that). After I pondered who I was for a few moments, I then turned my thoughts to what other people see when they look at me. When my children look at me, who do they see? When my husband looks at me, who does he see? When my parents look at me, who do they see? When my friends look at me, who do they see? When a stranger looks at me, who do they see? Would these answers be similar to mine when I think about the person I see when I look in the mirror? I was surprised to discover that I imagined other peoples’ answers would be quite different to my own. The concept of “self” seems to be a strange one. I may think of myself totally different to how someone else sees me… but which version is more true? Am I really seeing “me” when I look at myself every day… or am I thinking of myself critically… always focusing on my flaws, my imperfections, or even my childhood self? Do I tell myself “that’s not important” or “you’re not good at that” when I would never think of someone else the same way? Am I treating myself as a real person – with legitimate needs, a unique personality, and true gifts to offer the world? Or am I just glazing over when I look at myself… dismissing this person (me) as someone I don’t really need to pay much attention to? Do I really know myself? Do I value myself? Do I take myself seriously? Have you ever had a moment when you realised that you weren’t who you thought you were? Maybe you were someone different? Maybe – if you saw yourself from the outside – you might not be that bad? Might you remind that person that even if they did not complete three things on the “to do” list, they were still busy with a dozen other jobs that made the household run smoothly? Might you tell them it’s okay to set aside some time for a favourite television show at the end of a long day… that it’s okay to relax and do “nothing” once in a while? I encourage you to look in the mirror and see yourself. Really see yourself. Then look at yourself through the eyes of others and think about who you are to them. I bet you won’t be perfect… because none of us are. But I also bet you won’t be half as bad as you thought. In fact you are probably trying really hard at this thing called life. And I bet those around you think of you a lot differently – and a lot better – than you think of yourself. What would you like to say to that woman? 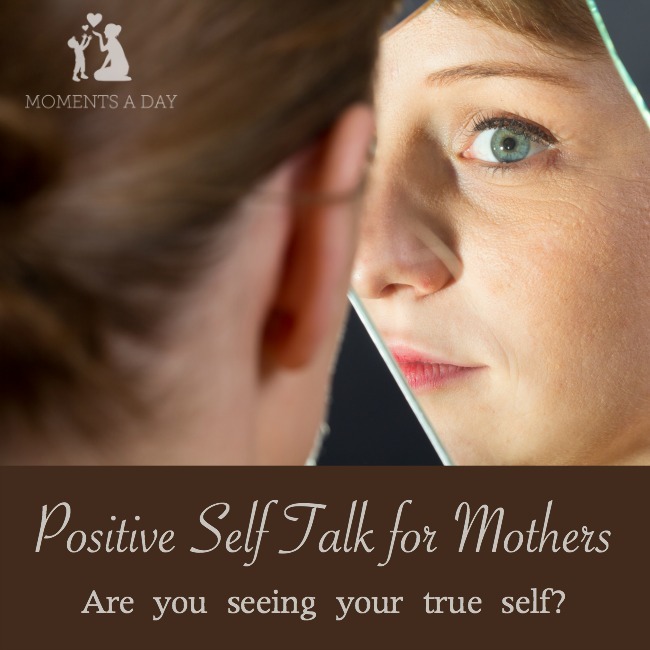 Would you be kinder to yourself, looking from the outside? Thank you, Chelsea! It’s been a rough week, been very hard on myself. This hit home today. Your writings are wonderful, Chelsea… and, oh, so relevant! Thank you for sharing your thoughts which are helping so many. That’s really insightful. As Mommas, I think we tend to loose who we are. Good article! So true! We are given responsibility over the needs of others, so always tend to put ourselves last. I think that my issues might be the exact opposite of yours. When I look at myself, I see someone who is trying their hardest to be good/perfect/enough/everything. Conversely, I feel like when others look at me, they see “bad”. I’m so sorry you feel this way, Meagan. It’s a pity if people do not see how hard you are trying. I’m sure there are many different situations everyone can fall into… and people can misunderstand us or simply have a different opinion on how things should be done. It can be tricky! I hope you find some peace soon. Yay so glad to hear you will be watching out for negative self talk 🙂 Wishing you the best!! Thanks so much for sharing, Kate. It’s amazing how self image changes over the years. I really hadn’t thought about it for a long time!